Elizabeth is multi-talented and great at everything she does, and she’s ready to share all her secrets with you. With 178 stitches, automatic needle threader and drop in bobbin, this feature-packed machine sure has a lot to say! Elizabeth can help you make a statement with every project, from home décor to accessories and garments. 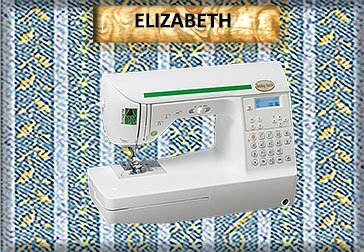 But don’t be intimidated – with push button features, knee lift and extension table, count on Elizabeth to help make any project easy and successful.